We were appointed by a developer client as landscape architects on this 1,700m2 brownfield site. Our scope was to develop a sketch landscape design for the approval of our client and the design team. 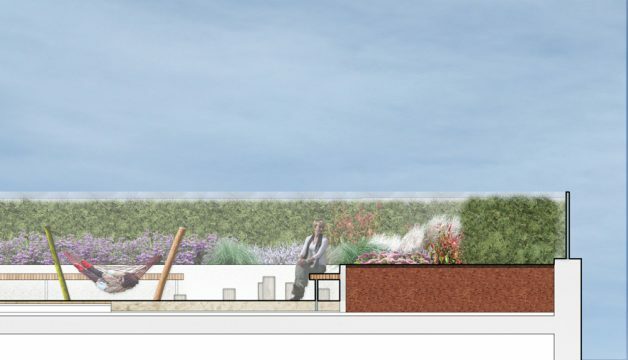 We were then tasked to provide landscape architect ‘s information to support a detailed planning application, including a written landscape design statement. The proposed development consists of a 4, 5 and 18 story residential building that is to accommodate 110 residential dwellings. Retail and office spaces are located at ground floor level. Below the building footprint a basement car park, cycle parking and mechanical and electrical plant are located. 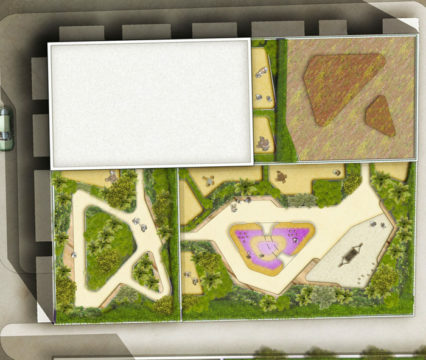 The Level 1 & 5 landscapes provide private patios and shared amenity spaces within a cohesive landscape design. Views from above has been considered by our landscape architects when designing these space. A variety of seating opportunities are provided in the form of integral sculptural benches. 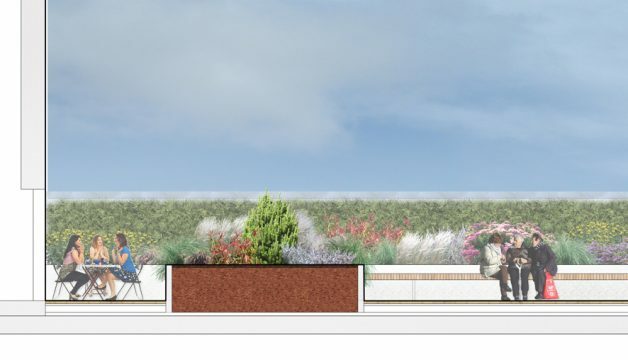 The planting has been considered carefully so as to be visually pleasing all year round, to be suitable for use in the raised planters specified and to be suitably drought tolerant. Glass balustrades are specified to the parapets of both these spaces. These balustrades will help to attenuate the potentially windy conditions and accommodate views of the surrounding area. At Level 1 100m2 of under 5’s ‘natural’ play has been integrated seamlessly into the landscape design. Our landscape architect’s design is considered as a whole and there are no barriers between the play and ‘adult’ areas. A contoured impact absorbing ground plane form the base for the area of play. 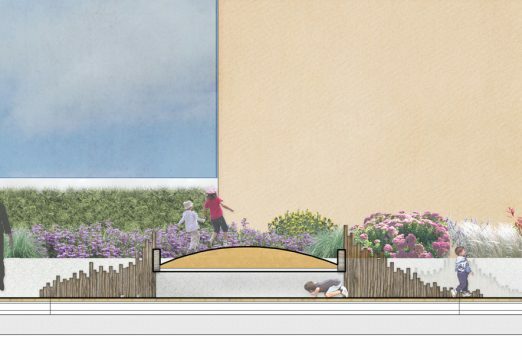 Play elements integrated into the design include a tunnel, a sculptural wall and other unstructured play elements. At Level 4 two private patios abut the building, providing private amenity space for the two adjacent dwellings. 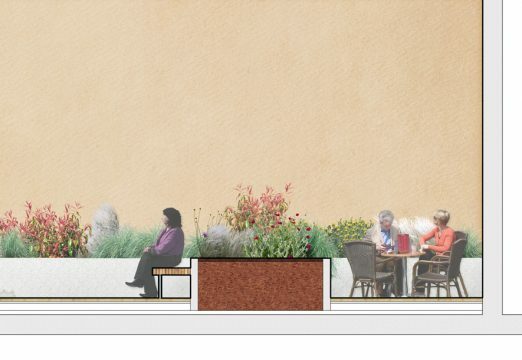 Both patios are bound by raised planters with ornamental and hedging type planting. 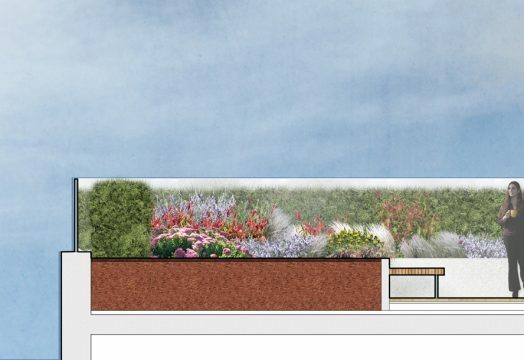 Beyond the raised planters a large Sedum roof is specified.